A fun way to encourage students to read more Latin and to help them learn about the genres of classical literature and disciplines within Classical Studies. Review posted 3 Aug 05 at: http://www.desalvo.org/blog/?p=462 The Adventures of the Monkey Pilosus Naso The super nice folks at Bolchazy-Carducci Publishes, Inc. invited me to be part of a trial program where they are letting bloggers review their books. Given the fact that many homeschoolers are teaching their children Latin, and given that most of us keep in touch with each other via the interwebnets, this makes total sense. I’ve never done an in-depth book review before, but I hope that I get to do more. I first became aware of this publisher when I started studying Wheelock’s Latin and was looking for flash cards. They just so happen to offer a nice set of cards that I ended up buying as my birthday present to myself this year. If you are studying Latin or Greek on your own then you really need to check out their catalog. It’s fantastic. Particularly cool is the collection of Latin translations of Dr. Seuss books that they publish. Mr. Party Baby is particularly fond of Virent Ova! Viret Perna!! (Green Eggs and Ham) and has me read it to him all of the time. 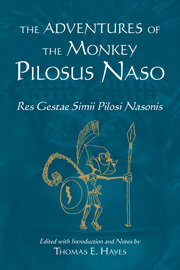 Anyway, the book that I am reviewing is “The Adventures of the Monkey Pilosus Naso: Res Gestae Semii Pilosi Nasonis” by Thomas E. Hayes. It is an intermediate text and there are quite a few things that I like about it, as well as a couple that I don’t. Intent - The author says that he hoped to provide an interesting story for students who’ve had about a year or so of Latin study. He hoped to bridge the gap between the simple writings in Latin textbooks and the more complicated forms used by Classical authors. I’m certainly always looking for more material to read, and as much as I want to read the oratories of Cicero, I’m just not ready yet. So, big thumbs-up towards he effort to get more intermediate material available. I believe that this book is intended more for younger readers and will certainly be less daunting than most Classical, or Medieval Latin texts. The deeper purpose is clearly to inspire readers to continue their Latin scholarship into the classics. The way the author goes about this is kinda neat. At the end of the book there is a large section of fictitious “scholarly” material that traces the history of the discovery, authentication, and normalization of the manuscripts for the story. I would hope that after seeing how the study of Classical Latin and Greek texts employs archaeology, history, sociology, mythology, etc. that the reader will understand that the story itself is just the surface, and that there is also really neat stuff as the foundation of it all. However, given this intent to make the classics interesting, I was a little put-off by the illustrations in the book. They were riddled with anachronisms, and that just seemed to fly in the face of the author’s intent to create a story matching the style of 2000 years ago. I’m betting that the ancient ideal of a witch didn’t include a wart-covered nose and a pointy hat. Certainly Coca-Cola bottles weren’t to be found. Overall, I found that the quality of the illustrations did not match that of the text, and will likely only be appealing to extremely young readers. Presentation - The book is nicely typeset with a readable face. The layout of the story is your typical facing-page style. Each new page of the story text is on the right, and the relevant vocabulary, notes, and summary on the left. I found the brief summaries really useful. Even if some of the grammar here and there is beyond the reader’s grasp, it is still possible to focus just on the bits you do know and still keep up with the narrative. Notes - As someone learning Latin on their own I found the running notes accompanying the vocabulary especially useful. Not only were specific words listed, but also idiomatic forms. In many other books that I’ve read I’ve only been presented with a word, its declension/conjugation, and a definition. This book went beyond that to point out things like, “this is a purpose clause in second sequence,” or “this is an example of a double dative”. With these extra notes it was easy for me to go to the index in Wheelock’s and find information about these aspects of grammar and syntax. In the back of the book are even more heavily detailed notes. The story borrows from Classical authors and themes and the notes give plenty of references to other authors and works. I’m sure that young readers will recognize story elements, or character traits, and then see in the notes that they originally came from a Classical source, and then hopefully will be inspired to see what it was all about in the original work. Story - The story is that of a tailless monkey who learns of his divine parentage, goes off to seek his destiny, and finds adventure and renown. The story had a good mix of narrative and dialog, and moved along at a good pace. It is broken down into sections so that the reader has manageable chunks to work. My only real complaint with the story is that it isn’t long enough! Of the books 220+ pages 50 are story, 50 are facing-page vocabulary and notes, and the other half is devoted to commentary, detailed notes, and glossary. I think that a student with a year or so of Latin under their belt will tear through this in just a couple of sittings (at least I would hope so). Maybe it’s just me but I am always lamenting that I have worked through all the material I can find at the level that I’m at and then I run out. I want more, more, more. But I don’t think I am the target market for this book. The story is fun, and Pilosus travels to lots of places, and meets lot of people from the Classical world. I know that #1 will enjoy this book once he’s gotten through more of Wheelock’s. In summary: I would recommend this book for the young Latin student. The 50 pages of story are enjoyable, and the supplementary materials provide wonderful support for the study of the grammar, vocabulary, and syntax used in the story. It’s possible that Herself will be writing her own review from the point of view of someone who has had years of formal Latin education. I’ll post it as soon as she’s written it up. Salvete!